Two Saturdays ago, I went on my first longer trail run. 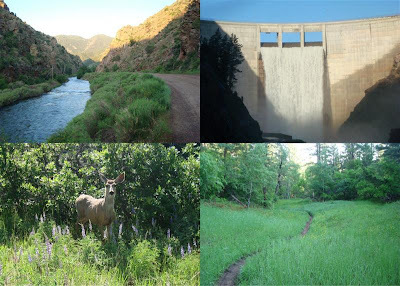 It was a 14 mile loop from Waterton Canyon over to Roxborough State Park. I like to get up and out early so I can get most of my run in while the ladies of the house are sleeping. Despite living only 20 minutes away from Waterton Canyon, I had never been up the 6 mile dirt road to the Strontia Springs Dam. Wow, what a sight that was. It's 234' high! The water was gushing out the top and thundering as it exploded on the riverbed below. The five miles of trail over to Roxborough were serene. It had rained the night before so everything glistened as the sun came up. Every twist and turn in the trail brought something new and beautiful to take in. I'm not kidding when I say I almost ran right into my friend in the photo above. I really enjoyed this first foray into trail running. Leaving the pavement, people, cars, and intersections behind and finding forests, meadows, rivers, wildlife & wildflowers is a gift. Running is a gift and I'm grateful for the opportunity to use my legs this way.